“News has reached me of Master Beaumont’s efforts to move coal from Strelley to Wollaton Pits. His new invention will carry coal with wagons, with small wheels made from a single slice of oak, running on wooden rayles. I return home enlightened by this insight and possible cure for heavy loads our roads are yet in unmade condition”. This statement announced the building of Britain’s first ever railway, in Wollaton, Nottingham. The idea was the brainchild of ‘coal businessman’, Huntingdon Beaumont, who, although he was a mining engineer and entrepreneur, was a hopeless businessman. Beaumont was born 1560, in Coleorton in Leicestershire. His parents were Sir Nicholas and Anne Beaumont, – nee Saunders. By Elizabethan standards, the Beaumont’s were a well to do family. The family owned coal bearing lands and made their money as mining entrepreneurs. This upbringing in the coal industry played a major impact on the young Huntingdon, and he would go on to make his own way in the mining industry. In 1601, Beaumont turned his attention to Nottinghamshire. He leased ‘pits’ from Sir Francis Willoughby, the first in Wollaton and two years later in Strelley. While running these pits he introduced various improvements such as boring rods and horse driven pumps. However, his new invention of carrying coal in horse drawn carriages running on wooden-rails impressed Willoughby the most. The ‘overland’ line, made from wooden rails, was approximately two miles long, and ran from Wollaton to Strelley. Work on laying the track started in October 1603 and was completed exactly one year later, at the cost of around £166. The waggon-way was built to carry coal from the Strelley Pits to a distribution point near Wollaton Lane (now Wollaton Road). Most of the coal was then taken onwards by road to Trent Bridge and then on downstream by barge. Beaumont was ‘let go’ by the Willoughbys after the expiration of his lease and he moved on to try his luck in Northumberland. His ventures there also failed. Over a long period of time Huntingdon Beaumont lost huge sums of money and sadly died in Nottingham Gaol in 1624. Despite his failings, his legacy lives on and his invention went on to influence great engineers like Isambard Kingdom Brunel and George Stephenson. 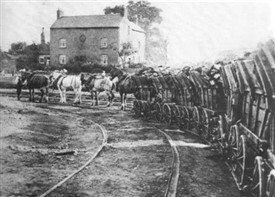 Huntingdon’s simple waggon-way went on to become the basis of the world’s railway systems today. Article by Joseph Earp and Iris Tansley. The New Nottingham Hidden History Team. This page was added by Joseph Earp on 10/02/2012.